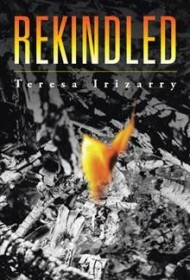 Teresa Irizarry’s impeccably researched debut historical novel, Rekindled, explores how Roger Williams introduced the principle of separation of church and state by founding Rhode Island as a place of religious tolerance. The novel’s beginning chapters alternate between England and New England in the early 17th century. Williams is a promising language student and law clerk but desires to spread the Gospel overseas: “I am determined to become a serious student of God’s spiritual algebra and learn how to apply it to the new cultures we find in America,” he writes to a friend. To that end, he studies theology at Cambridge. Meanwhile, portions set in New England show Algonquian Indian tribes setting up a wampum factory and fighting against the English. When Williams accepts a position in Salem, he begins studying the Algonquian language and develops deep respect for their culture. Because he doesn’t view them as “heathens,” he decides they shouldn’t have to adhere to biblical customs. Williams’ several-weeks journey through a blizzard to find an Algonquian encampment, as he runs from a summons to appear in court on charges of sedition and heresy, is one of the plot highlights. Irizarry fills the decades-spanning storyline with familiar historical figures such as Walter Raleigh, John Milton, and Anne Hutchinson. Through period detail, she renders each location—from Newgate prison to Massachusetts settlements—authentic. However, at times evidence of research is heavy-handed, as in multiple pages on wampum trading. Her use of some modern slang (“wimp” ; a “hot potato” issue) is also jarring. Appendices include a character list and excerpts of Williams’ writings, both of which are helpful. But the Prologue set in 48 AD and a final section in which a modern Christian interviews Williams in heaven (asking if he supports gay marriage, for instance) distract from the central story. Nevertheless, this is an absorbingly detailed portrait of 17th-century Christendom. As an early proponent of American religious freedom, Williams is worth celebrating. Highly recommended for fans of Hilary Mantel’s Wolf Hall or Geraldine Brooks’s Caleb’s Crossing.